Starting in Modane, I headed up on a little road behind town. 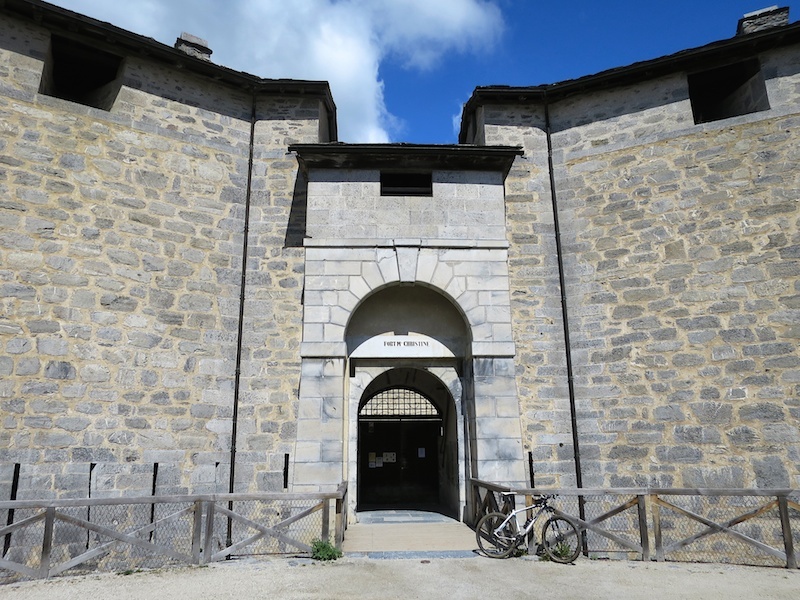 After perhaps four kilometres I turned onto a fantastic even quieter road (marked as “Cycling Route 30”) that heads up to Aussois via several 19th century forts. You can take the more direct main way (on the map, it’s how I descended) … but my way is far superior in my opinion – I saw zero cars and the forts are fun. This fort road end in Aussois, a little ski station just below 1500 metres. The road to the dams is well signed and winds up the ski slopes from the center of town. In fact it passes under ski lifts several times. Lots of nice hairpins. 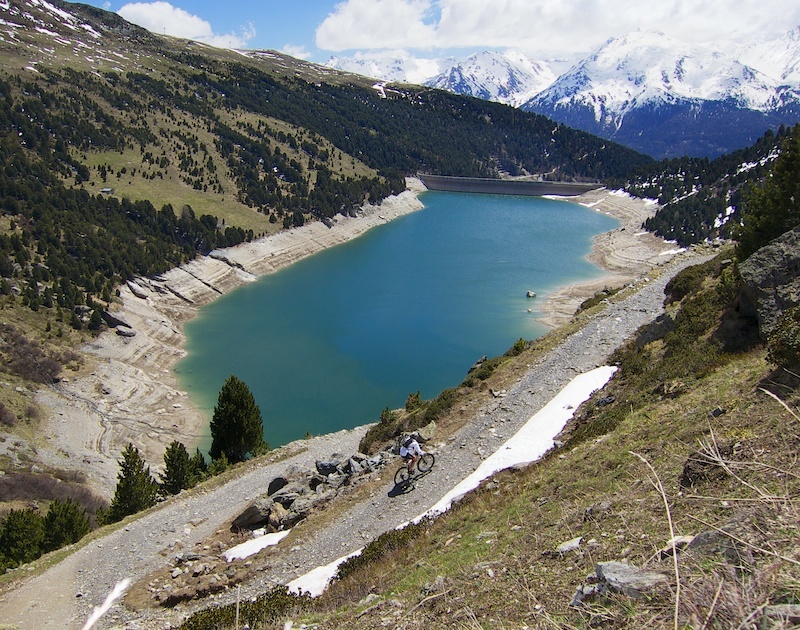 The first dam – Plan d’Aval – is at roughly 2020 metres, NOTE, the paved road ends here! You can see the second dam in the distance in the photo below. 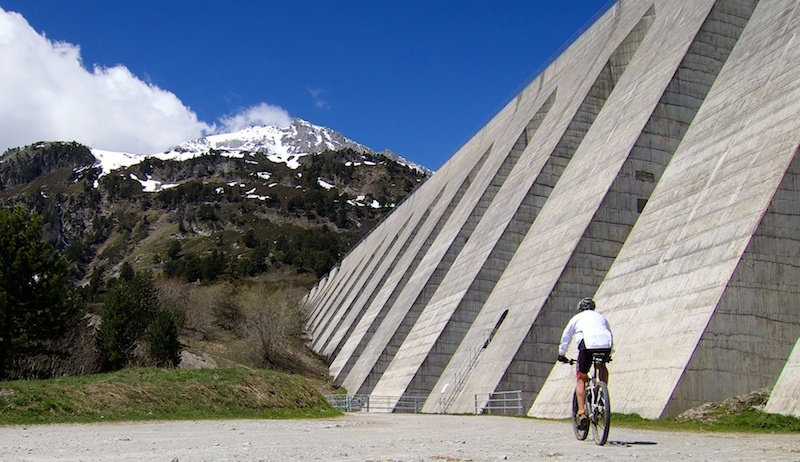 I had brought my 29’er though so I continued up a rocky road to the second dam – Plan d’Amont. The road runs right under the dam. But it looked sturdy enough. Cars are forbidden past here, but there is an even rockier road that leads up to the top of the dam. I had expected to turn around here, but there is an amazing road running up the left side of the lake. Ride-able. I saw a couple of foxes and perhaps 20 marmottes on this very fun road. 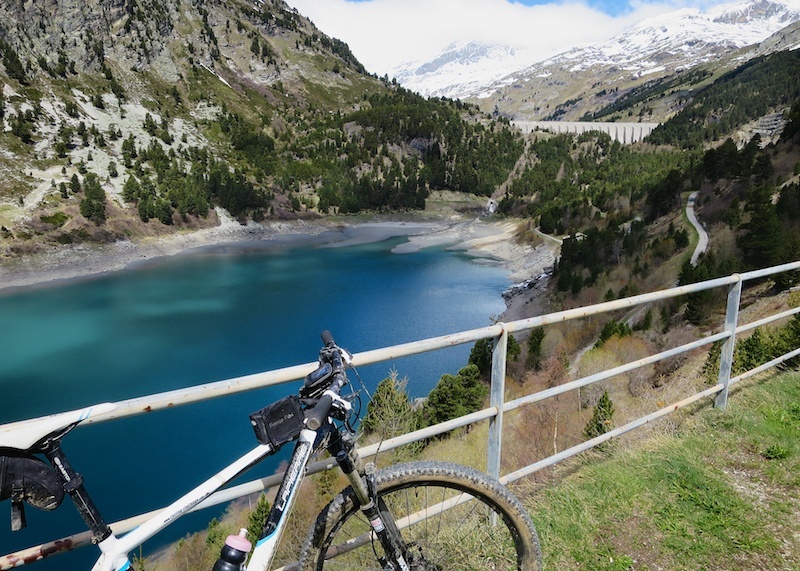 It runs past the far end of the lake and continues up to 2208 metres, but here at the Pont (bridge) de la Séteria the road becomes more of a hiking trail. I went a little higher but it was cold, very windy, steep, lots of snow, etc. 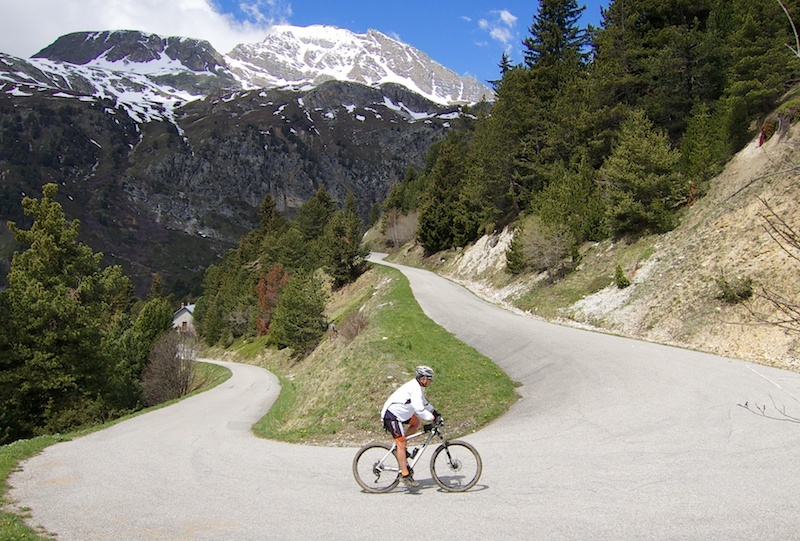 But it looks a fantastic place to hike, and it’s possible to go over Col d’Aussois at almost 3000 metres. I descended back towards the first lake, and with the intent of going around the lake, turned down on a little road that soon turns into a hiking trail. The lake was far from full and there were a couple of big sand bars, so I headed down for a photo. Heading back, I decided to take the paved road down, but – for the adventurous – there are several mountain bike trails that are well signed. This is a great climb to two beautiful lakes. They’re probably even more beautiful when fuller. Definitely worth returning on a bike or just to hike up high. This isn’t the tourist high season, but once I left Modane and joined the Fort road, not a single car passed me the entire climb. 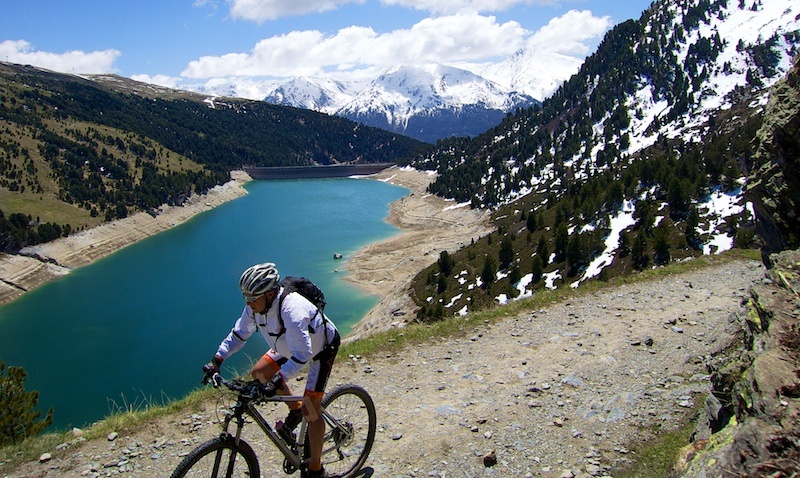 Superb little road past several 19th century forts, then up to 2 beautiful alpine Lakes. What's not to like?